Hit the trail this summer in the Great Northern Catskills of Greene County where the region’s storied history and rugged beauty are best experienced in the wilderness. Discover the land that captivated generations of painters and writers, and enjoy a hiking trip that unites art with nature, and adventure with family-friendly fun. Known as the father of the Hudson River School of Art movement, Thomas Cole was a British expatriate who made the Catskills his home, muse and artistic study. Follow Cole’s artistic journey through the Catskills and experience far-reaching summit views and cascading waterfalls that are as pristine as they were when Cole painted them nearly 200 years ago. His namesake peak, Thomas Cole Mountain, is the fourth highest peak in the Catskills, with panoramic summit views and multiple scenic overlooks. Located in the Blackhead Range Wild Forest, Cole can be hiked in tandem with Black Dome and Blackhead, making for the perfect Catskill Mountain day hike. The trailhead is located at the end of Barnum Road, just four minutes drive from the Sugar Maple Center for Creative Arts in Maplecrest. This summer, experience a series of self-guided, multi-faceted hiking excursions with Mainly Greene, a collaboration of four arts organizations in the Great Northern Catskills. On July 20, join Mainly Greene’s “Art on the Move” tour of the Catskills with the Catskill Pass as your guide, and check out some of the Hudson River waterfront’s top attractions, restaurants and shops. Download the Pass here and follow the enclosed map to receive special discounts at participating attractions, including the Port of Call Restaurant, Thomas Cole National Historic Site and Riverview Marine Services. RamsHorn-Livingston Sanctuary in Catskill offers a tranquil hiking experience along two miles of hiking trails. Trek by swampland with diverse birding habitats and glimpse Great Blue Herons, Bald Eagles and water creatures such as beaver, otter or muskrat. The Sanctuary offers leisurely walking experiences, picnic spots and paddling opportunities along RamsHorn Creek. Cohotate Preserve in Catskill offers two miles of hiking along the Hudson River waterfront. Perfect for families with small children, the loop winds around a pond, providing scenic wilderness and river views. Catskill Escarpment Loop in Haines Falls offers a moderate hiking circuit looping nearly five miles through some of Greene County’s prettiest scenery. Highlights include Kaaterskill Clove, Sunset Rock – a favorite spot of Hudson River School artists – and Inspiration Point. Part of the 21-mile Escarpment Trail, this shorter loop offers a great day hike in the Catskills. Awaken to Adventure in the Great Northern Catskills of Greene County, offering some New York’s most far-reaching summit views and scenic hiking trails. 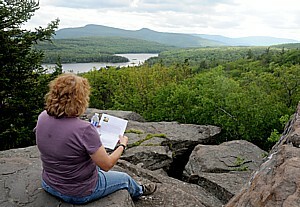 For more information about hiking in the Catskills and to start planning your Greene County vacation, visit www.GreatNorthernCatskills.com. Greene County is located in the Great Northern Catskill Mountains and the verdant Hudson River Valley. The region is home to five of the 10 highest Catskill Peaks and the Catskill State Park and is known as the nation’s first wilderness. Greene County is renowned as the home of Thomas Cole’s Hudson River School and the inspiration for Washington Irving’s literary legend, Rip Van Winkle, and was named in honor of American Revolutionary War General Nathanael Greene. This 705,500 acre wilderness offers diverse year-round outdoor recreation and celebrated cultural events. Find more Catskills packages at www.GreatNorthernCatskills.com.